This butternut squash casserole recipe is similar to a mashed potato casserole. 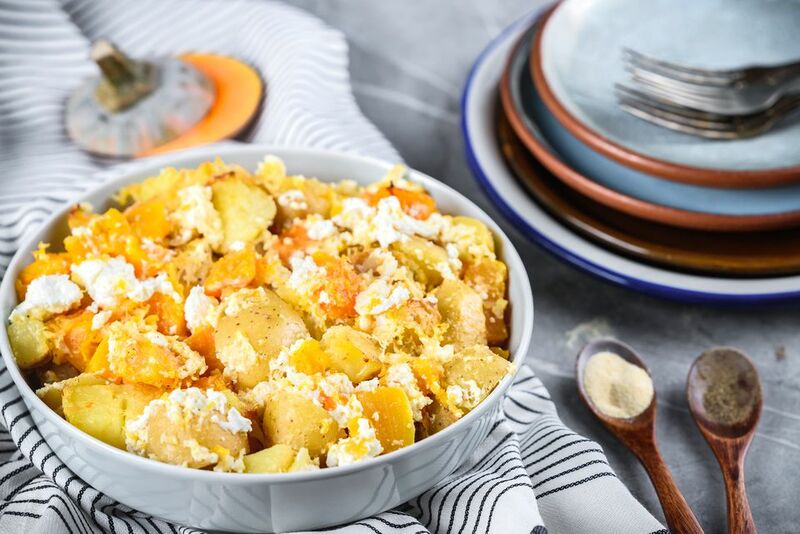 The butternut squash and potatoes are boiled, then mashed with butter, milk, cream cheese, and ricotta cheese. The butternut squash casserole is then topped with cheese and baked. This butternut squash recipe makes a great Thanksgiving side dish or make-ahead side dish when butternut squash is in season. Gather the ingredients. Preheat oven to 350 F.
Place butternut squash and potatoes in a large heavy pot and cover with water by a depth of 1 inch. Boil, uncovered, until tender, 12 to 15 minutes, and drain. Return butternut squash and potatoes to pot. Add butter, milk, cream cheese, ricotta, salt, pepper and half of the romano cheese. Taste and adjust seasoning. Spread butternut squash casserole into a prepared baking dish. Sprinkle remaining Romano cheese on top. Bake butternut squash casserole 30 to 45 minutes until cheese is golden brown. To make ahead, stop at step 7. Allow the casserole to cool, then refrigerate or freeze, wrapped tightly, or bake.